The 1974 Topps Football Card Set – Kicking a Hobby "Field Goal"
The 1974 Topps football card set is perhaps most noted for its unique design on the front than anything else. Utilizing different-colored goal posts on the fronts to frame the card images, Topps incorporated part of the game into their cardboard. At 528 total cards, the set is substantial and Topps continued to generate sets of this exact size for several years. There are a couple of Hall of Famer rookies included such as punter Ray Guy as well as plenty of star cards, but one major star is missing from the set – Joe Namath. While no clear explanation has ever been provided for Namath’s absence, collectors still find this set appealing. In the following article, we dig deeper into this unique Topps issue. Collecting the 1974 O-Pee-Chee Hockey Card Set – The Sleeper Hockey Issue of the 1970s? The 1974 O-Pee-Chee hockey card set is one that some collectors feel is a real sleeper. Filled with Hall of Famers, more than any other hockey set of the 1970s, collectors are drawn to this eye-appealing issue. In fact, even though this set already boasts seven Hall of Famer rookie cards, many hockey fans believe the HOF designation might be assigned to even more cards as time goes by. At the current time, those cards of Larry McDonald and Denis Potvin seem to generate the most interest in high grade. There are even cards of head coaches included, like those of Scotty Bowman – a Hall of Famer himself. In the following article, we ask collectors why this seemingly attractive issue appears to be slightly overlooked considering its assets. During the 1980s, Topps produced several great football card sets but one could argue that the 1984 Topps set might be the best of them all, mainly due to the fact that the set contains two of the most important football rookies of all-time in quarterbacks John Elway and Dan Marino. In addition to those two, there are also several other Hall of Fame rookie cards included, like those of Howie Long and Eric Dickerson. This rather sizable 396-card set enjoys healthy interest from collectors as a result. The 2014 winner for Best Modern Football Set has an astounding 9.99 GPA – the best all-time on the registry – which means it contains all PSA 10s and a lone PSA 9. Click here to view this set. HURRY – Set Registry Special Ends 10/31! 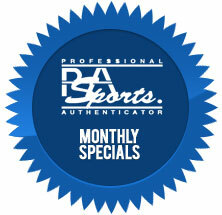 All Sports & Non-Sports Cards – $10 per Item/No Minimum – 20 Business Days (approx.) Click here for details. Nearly 3,400 lots now open for bidding in one of the largest auctions in Heritage history, Nov. 6-8, 2014, online at HA.com. While the name of John Kindler may be unfamiliar to all but the earliest football uniform collectors, the Nov. 6-8, 2014 Heritage Sports Collectibles Signature® Auction is about to make it famous. Every October, baseball champions are crowned—and sports legends are created. And October also is when Goldin Auctions, the industry’s premier sports auction house, offers its one-of-a-kind "October Legends Auction," featuring some of the most significant and unique game-used memorabilia from many of the greatest players in sports. From today through Nov. 1, collectors bid on more than 1,100 items in the Goldin Auctions October Legends Auction, including sports equipment used by the biggest stars, championship rings and awards, historical sports documents and hundreds of lots of rare cards. Love of the Game Auctions’ Fall, 2014 Premier Auction, the company’s first auction to feature a printed catalog, is open for bidding and closes this Saturday, November 1. The sale features sports and non-sports cards and memorabilia from the late 19th Century to the present, highlighted by a rare and valuable 1933 Goudey Nap Lajoie. The card, once owned by noted collector Charles Conlon, is one of the finest examples of the Goudey rarity in the hobby. Breaking THREE HIGH GRADE PSA Graded Partial Baseball Sets card by card on eBay. 64TBB – 300+ PSA Cards with 230+ PSA 9’s ending Tuesday November 4th. 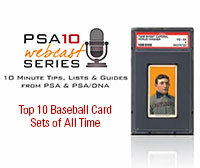 65TBB – 250+ PSA Cards with 180 PSA 9’s ends Wednesday November 5th. 70TBB – 400+ PSA Cards with two PSA 10’s, 250 PSA 9’s and a group lot of 8’s and 8.5’s ends Thursday November 6th. Babe Ruth Rookie Sells for $84,000; Rare McKinley Card Hammers Down At $96,000, Setting Non-Sport Card Record! Collectors turned out in full force for Robert Edward Auctions’ Fall Auction, the second such event added to the company's calendar after many years of conducting a single blockbuster Spring Auction. An incredible 15,710 bids were placed on the 1410 different lots offered for sale, 98.5% of which sold to an impressive 576 different winners. The auction ended with total proceeds of $4,072,980. There are 828 lots for auction that will end on Thursday October 30, 2014 at 11 PM EST using the 15 minute rule. This auction features many high grade and low pop cards for collectors to complete their sets from the 1950’s through the 1970’s. The auction is loaded with high grade cards and HOFers including a large number of 1952 Topps, 1955 Topps including some very though 8s and much more. Over the next several auctions, there will be a lot of nice 1955, 1956 and 1957 Topps baseball. Which of the following sets from the 1970s is your favorite?